Your dog may spend most of his or her time chilling inside with you, but that doesn’t mean there aren’t still places for your best friend to get some alone time. Here are some incredible doghouses whose designs may put your own human home to shame. Keep your pets and plants in the same place with these interesting doghouses by Pousse Creative. The colorful homes can be kept inside or outside, offering a flora-roofed den for your furry friend. Redditor dogeaterr came across this combination doghouse fish tank at his vet’s office. More decorative than practical, this structure is nevertheless an impressive feat of animal architecture. If you have $40,000 lying around, consider buying your dog a replica of one of the Seven Wonders of the World. The house is made to order and is constructed from architectural foam and stucco. As Ronald Reagan was leaving the White House, The Camp David Seabees presented him and Rex, his Cavalier King Charles spaniel, with a fantastic White House replica doghouse. Designed by Theo Hayes, the great-great-grandson of President Rutherford Hayes, the house is perfect for a presidential pooch. On the inside are red drapes, a swatch of carpet from Camp David, and framed photos of the President and First Lady. If you love the doggy lifeguard angle but are looking for something a little different, you actually have some options. This alternative by Etsy store BohemianWorkbench comes with tinted acrylic windows, working shutters, and a removable ramp. Lovers of contemporary architecture can share their sense of style with their dog by giving them a Puphaus. These super-modern doghouses are made from western red cedar and Portland cement board. Dog dishes can be slipped into the floor board, and a floating roof allows for air flow. Inexplicably, there are a ton of trailer-themed doghouses out there. 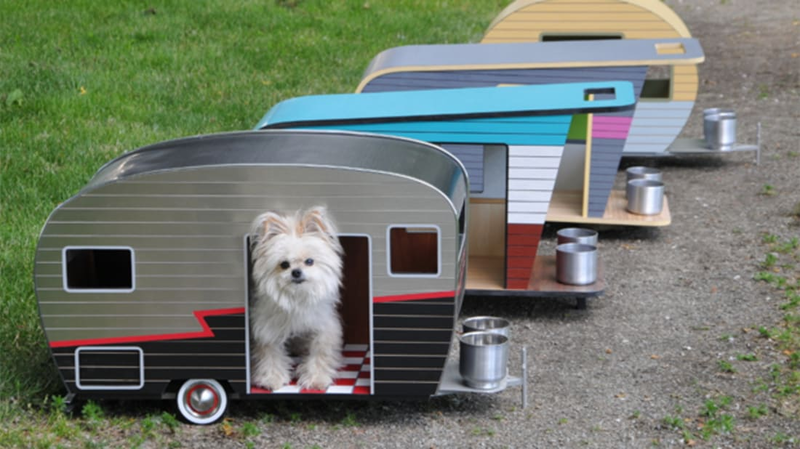 Judson Beaumont of Straight Line Design has made a whole series of retro campers just for your pet. The trailers are completely customizable and made with environmentally friendly materials. The same designer also made this cool aluminum camper for an even more classic look. If you want something a little different, Italian designer Marco Morosini has his own spin with a white ceramic caravan. Interior designer Michelle Pollak is responsible for La Petite Maison, a line of elaborate doghouses. The lavish mini-mansions come in many forms and styles, like the Victorian estate seen above. “Half our clients say, ‘Hey, we’d like a replica of our home for the dog,’ and half say, ‘This is the dream house we’ve always envisioned but couldn’t afford in real life’ — like a French palace for the French poodle,” Pollak told The New York Times. Artist Bruce Tunis decided to share a little Brooklyn charm with his two pugs by building them a tiny brownstone apartment. The convincing replica even comes with a lamppost and shrubbery. What is a hotel heiress without impressive accommodations for her dog? Paris Hilton had a canine mansion built for her dogs, designed as a replica of her own home. The house—which is big enough for humans to enter—has a closet full of clothes, a chandelier, and tiny sofas. It's also heated and air conditioned, so the pampered pets live pretty comfortably. Redditor blurplegreen created this expansive house for his dogs, pictured above. The architect shows an eye for detail here by including address numbers, window curtains, and potted porch plants. Cats need a place to relax too! Last year, L.A. architects designed unique cat houses for the Architects for Animals "Giving Shelter" fundraiser. One particularly cool example is this grassy couch-like structure by Space Int'l. Cat lovers can chill with a book on top while their feline friends explore the inside below.